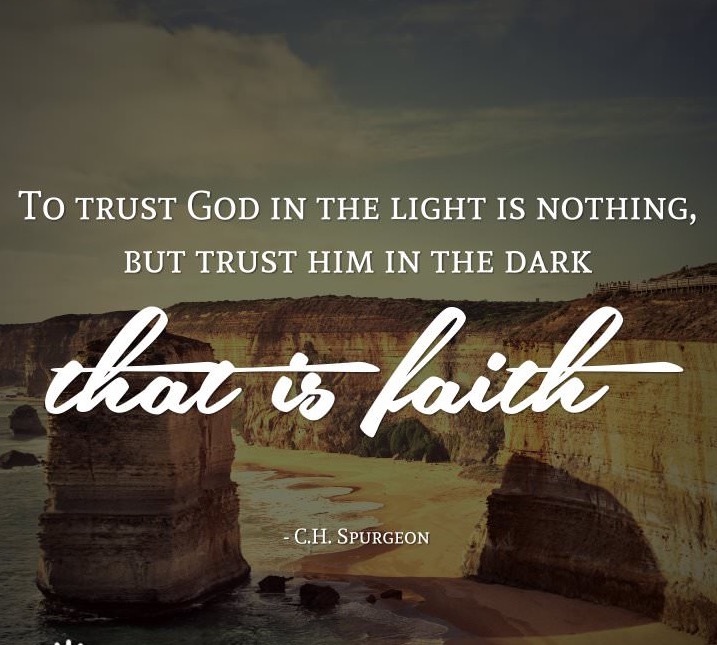 Trusting God in the light is easy peasy. However, trusting God in the ominous depths of darkness is moderately arduous. So how do we trust God while navigating through the valley of fear? Well, Tony Evans put it this way, “As we consider how to trust God in the dark places in our lives, let’s also think about the story of Peter as he saw the Lord walking on the water. Jesus told him to come out on the water with Him. Peter stepped on the water, but the Bible tells us he began to get distracted by the wind and waves whipping around him. In other words, he began to focus on his circumstances. When Peter took his eyes off the Lord and began to focus on his situation, he began to sink. Just like Peter, we will sink every time if we are focused on our circumstances instead of our solution, Jesus Christ.” The solution is not giving up, it’s not detaching, nor is it becoming a bravado! God resolutions are different with different individuals and situations because God doesn’t have a ‘cookie-cutter’ way of doing things. But He is the same in His purposes, and He will always accomplish His plan. So today, trust Him and continue to move forward!